Text-messaging apps are the most-used apps on smartphones worldwide — and they're getting more powerful all the time. And no wonder: Besides texts, you can send photos, videos, animations, stickers, music, and more. Apple's text messaging app is called Messages, and it's built into every iOS device and every Mac. Sending texts with Messages is easy and free, but unlocking all of its features requires some knowledge. Confusing the issue is iMessage, a messaging function that lives inside the Messages app and that runs on a different platform than Messages. Messages is the default texting app for iOS on any iPhone, iPod touch, and iPad. It lets you do all the basic things you'd expect: Send texts, photos, emojis, and all the other standard texting stuff. On the other hand, iMessage is an Apple-specific set of features and tools that are built on top of Messages. 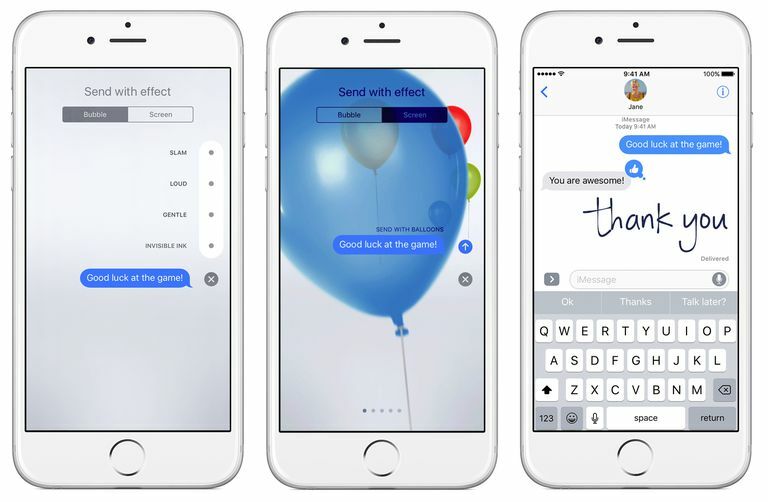 The advanced features used in Messages come from iMessage. You can use other apps to send texts from your iPhone, but if you want to use all of iMessage's features, your only option is to use the Messages app. The iMessage features are enabled by default, but it is possible to turn iMessage off. To disable iMessage, tap Settings > Messages. Move the iMessage slider to Off/white. Do You Have to Have an iPhone To Use iMessage? The iMessage service works on all devices that run iOS 5 and higher, including the iPod touch and iPad. It's also built into the Messages app that comes with all Macs running Mac OS X 10.7 and later. Does iMessage Mean You Can't Text People Who Don't Have iPhones? The Messages app lets you text anyone whose device can receive standard text messages, including people using Android and other phones. If those people don't have iMessage, though, they won't be able to use any of iMessage's features. Any iMessage-specific things you send, like animations, won't work on their devices. How Can You Tell When You're Sending an iMessage Rather Than a Text Message? Your word balloons are blue. The Send button is blue. The text-entry box reads iMessage before you've typed in it. Depending on the recipient's read-receipt settings, some iMessages will also say Delivered beneath them. Text Message in the text-entry area. Sending an iMessage to another iMessage user is free. SMS messages still cost whatever your phone plan charges, though texts are free with most plans these days. Does iMessage Work on Android or Other Platforms? It's an Apple-only platform, although there have been some rumors about iMessage coming to Android. On the other hand, if all of the cool features of iMessage are exclusive to Apple products, that's an incentive for people to buy iPhones instead of Android phones. What Multimedia Can You Send Using Messages? All types of multimedia that you can send with regular SMS text messages can be sent using Messages including photos, videos, and audio. In iOS 10 and later, some additional features of iMessage make sending media even more useful. For example, if you send a video or a link to YouTube, the recipient can watch the video right in Messages, without going out to another app. Links open in Messages rather than Safari. If you share an Apple Music song, the recipient can stream the song right in Messages. Whether you're using iMessage or SMS, if you're having problems sending text messages, learn how to fix it in iPhone Text Messages Not Sending? Here's How to Fix It. Can You Use Messages on Multiple Devices? One major benefit of iMessage is that all of your compatible devices are synced, so you can continue conversations across devices. However, you can't use your iPhone's phone number as your Messages address because the iPod touch and iPad don't have phones in them and aren't connected to your phone number. Instead, use both your phone number and an email address. To configure your accounts, tap Settings > Messages > Send & Receive. Ensure that all of your iOS devices use the same email address. It may be easiest to use your Apple ID. What Kind of Security Do Messages and iMessage Offer? The basic Messages app doesn't have much in the way of security features. Because those texts are sent over your phone company's cellular networks, they have only whatever security the phone company offers. However, because iMessages are sent through Apple's servers, iMessage is extremely secure. It offers end-to-end encryption, meaning that every step of sending messages — from your device to Apple's servers, to the recipient's device — is encrypted and secure. The security is so strong, in fact, that not even Apple can break it. When you send something via iMessage, you can be sure that no one will intercept and read your messages. Does Messages Use Read Receipts? Read receipts are available only when you use iMessage, not standard text messages. These indicators tell you whether someone has read your iMessage or tell senders that you've read theirs. To send read receipts to other people when you've read their messages, tap Settings > Messages then move the Send Read Receipts slider to On/green. Emoji are included by default in the iOS and can be used in Messages. A few new features related to emoji were introduced in iOS 10. For one, the emoji are three times bigger and easier to see. Additionally, Messages suggests words that can be replaced with emoji to make your texts more fun. Do Messages Include Snapchat-Style Expiring Messages? When using iMessage, you can send audio messages that expire after two minutes. To control that setting, tap Settings > Messages then tap Expire in Audio Messages and then pick a time period for expiration. What Other Fun Options Does Messages Offer? In iOS 10 and up, iMessage has a ton of fun features. These include standard chat-app tools like stickers that you can add to messages and the ability to draw on photos before you send them. You can use handwriting in your messages, too. Bubble effects are animations that you can apply to your messages to give them more oomph. You can make the bubble pop, animating it so your message is emphasized, or even use "invisible ink" that requires the recipient to tap the message to reveal its content. You can now send images and animations along with your text messages on the iPad. Think of iMessage apps as being like iPhone apps. In the same way that you install apps on your iPhone to add new functionality, iMessage apps do the same thing, adding functionality to iMessage. These apps work only when you have iMessage enabled. A good example of an iMessage app is Square, which lets you send money through iMessage to your friends. Or you could do a group chat with friends to collect lunch orders and then submit a single group order to a food delivery service. These apps are available only in iOS 10 and up. How Do You Get iMessage Apps? If you're running iOS 10 or newer, just swipe up the drawer at the bottom of the app and you'll be able to find new iMessage apps to install in the App store. Does iMessage Support Apple Pay? In iOS 11, you can pay people directly just by writing a message that requests money or mentions sending it. A tool pops up to specify the amount. Tap Send, and you'll be asked to verify the payment using Touch ID (or Face ID on the iPhone X). When that's done, money is sent from the payment account linked to your Apple Pay to the other person. This feature is great for splitting restaurant checks, paying rent, and other times when you need to pay a person, not a company.